Competing: "to strive to outdo another for acknowledgment, a prize, supremacy, profit, to engage in a contest." During the collegiate road season, week in and week out, animated individuals are competing and consistently pushing forward. While racing "Storm The Fort," a Stanford University hosted event in Seaside, California, I was brutally reminded of stern competition. Ba-da-boom, ba-da-boom, ba-da-boom. Sunday, April 9, began with an early morning awakening, 3:30 a.m. to be exact, prior to collecting three teammates. We rolled north from San Luis Obispo, California. The early-morning hours proved to be a time of peace and reflection, as my mates drifted, notching additional rest. Come venue arrival, Cal Poly Cycling swung into action. With a host of individuals competing, we managed to be a buzz of activity. 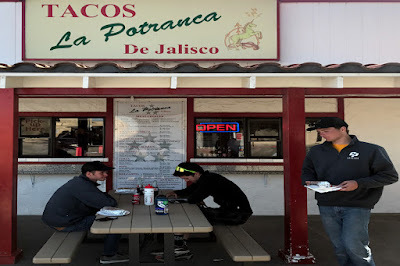 By 8:00 a.m., three categories containing Cal Poly Cycling members were cruising. Meanwhile, for those departing later in the morning, brief moments of rest were appreciated, before catching race finishes and beginning diligent preparation. 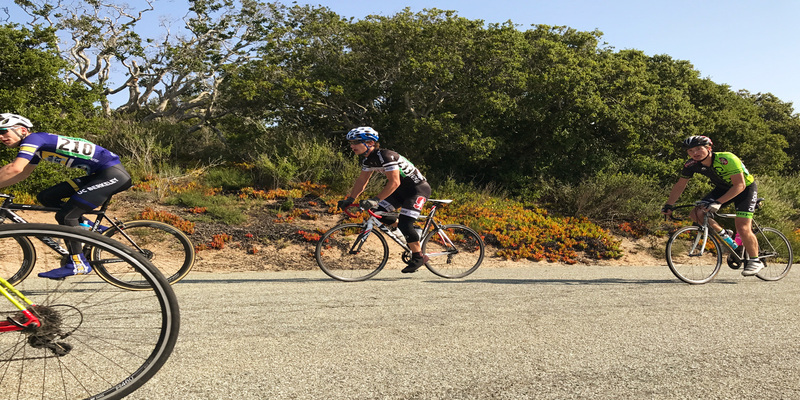 Throughout a weekend of racing, Cal Poly Cycling entered 20 events with 12 individuals. On Sunday, April 9, a win from Josh Gieschen in the Men's D race was a blast. For the birthday boy, it was only fitting to sing "Happy Birthday" at the race start. Also, Michael Beard earned a third place finish in the Men's B category, another positive showing for Cal Poly Cycling. Michael Beard (right), during the Men's B road race. With morning races wrapping up, a showdown in the Men's A race was approaching. Throughout the Western Collegiate Cycling Conference (WCCC) season, University of California, Los Angeles (UCLA) has been impressive. After consistently showing their force, this weekend would be no different. Racing around a choppy, punchy Ft. Ord course, UCLA was willing to put the hammer down, early and often. In a matter of minutes, 12 to be exact, the Men's A field was being shelled on Ft. Ord's lone, substantial climb. For a former military base, this seemed fitting. As the field strung out, a brief glance over my shoulder reminded me to "hop in my foxhole and hunker down," words formerly spoken by Yuri Hauswald, at Petaluma's Bantam Classic. For at least one more lap, of nine for the day, two teammates and I remained with the front group. As Peter Aster, from Cal Poly Cycling, rolled with me, I plainly uttered, "This is going to be a long day." After four laps with the front group, I was dispatched, before bouncing around and settling with a mid-pack finish. 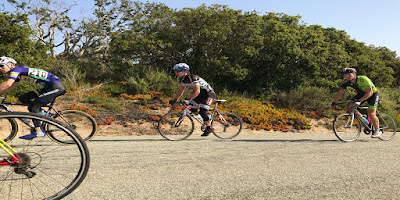 Colin Patterson, from Cal Poly Cycling, continued to fight, finishing with a top-ten finish in a hotly contested competition. With anything, great days are to be cherished, while poor performances need to be accepted. Despite the training, preparation, and interest, this was a tough day for many. With that being said, if it was easy, everyone would be doing it. This season, thank you very much for your interest in collegiate road cycling, while browsing multiple weekend dispatches. For the support, comments, and advice, thank you.